This story was updated May 9 at 6:37 p.m. ET. Light from an alien "super-Earth" twice the size of our own Earth has been detected by a NASA space telescope for the first time in what astronomers are calling a historic achievement. NASA's infrared Spitzer Space Telescope spotted light from the alien planet 55 Cancri e, which orbits a star 41 light-years from Earth. A year on the extrasolar planet lasts just 18 hours. The planet 55 Cancri e was first discovered in 2004 and is not a habitable world. Instead, it is known as a super-Earth because of its size: The world is about twice the width of Earth and has about eight times the mass of Earth. But until now, scientists have never managed to detect the infrared light from the super-Earth world. "Spitzer has amazed us yet again," said Spitzer program scientist Bill Danch of NASA headquarters in Washington in a statement today (May 8). "The spacecraft is pioneering the study of atmospheres of distant planets and paving the way for NASA's upcoming James Webb Space Telescope to apply a similar technique on potentially habitable planets." Spitzer first detected infrared light from an alien planet in 2005. But that world was "hot Jupiter," a gas giant planet much larger than 55 Cancri e that orbited extremely close to its parent star. While other telescopes have performed similar feats since then, Spitzer's view of the 55 Cancri e is the first time the light from a rocky super-Earth type planet has been seen, researchers said. But 55 Cancri e stood out because it orbits extremely close to its parent star; about 26 times closer than the distance between Mercury and our own sun. The new Spitzer observations revealed that the star-facing side of 55 Cancri e is extremely hot, with temperatures reaching up to 3,140 degrees Fahrenheit (1,726 degrees Celsius). The planet is likely a dark world that lacks the substantial atmosphere needed to warm its nighttime side, researchers said. And to top it all off, the planet is oozing. Past observations of the planet by the Spitzer Space Telescope have suggested that one-fifth of 55 Cancri e is made up of lighter elements, including water. But the extreme temperatures and pressures on 55 Cancri e would create what scientists call a "supercritical fluid" state. Supercritical fluids can be imagined as a gas in a liquid state, which can occur under extreme pressures and temperatures. On Earth, water can become a supercritical fluid inside some steam engines. 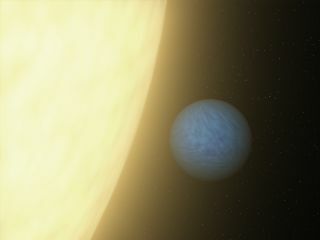 The previous studies of 55 Cancri e were performed by analyzing how the light from its parent star changed as the planet passed in front of it, a technique known as the "transit method." In the new study, astronomers used the Spitzer Space Telescope to determine the infrared light from 55 Cancri e itself. Spitzer's new look at 55 Cancri e is consistent with supercritical-fluid waterworld theory. The planet is likely a rocky world covered with water in a supercritical fluid state and topped off with a steam blanket, researchers said. "It could be very similar to Neptune, if you pulled Neptune in toward our sun and watched its atmosphere boil away," said the study's principal investigator Michaël Gillon of Université de Liège in Belgium. The lead author is Brice-Olivier Demory of the Massachusetts Institute of Technology in Cambridge. The research is detailed in the Astrophysical Journal. NASA's $770 million Spitzer Space Telescope launched in 2003 and is currently in an extended mission to study the universe in infrared light. During that extended mission, telescope engineers modified several settings on the observatory to optimize its alien planet vision, NASA officials said. The space agency's next major infrared space observatory, the James Webb Space Telescope slated to launch in 2018, could potentially reveal even more details about 55 Cancri e and other similar super-Earth planets. This story was corrected to reflect that one year on the planet 55 Cancri e lasts just 18 hours, not one day, and that it is not super-dense as previously reported.